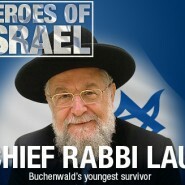 The incredible life story of one of my personal heroes, Israel’s former Chief Rabbi Lau. His story, I think, is an important reminder that a traumatic childhood can sometimes shape a phenomenal human being. Margalit Zinati is Not Leaving! I love hearing rabbi lau speak. he has such a way to get into the hearts of all jews. His book was recently translated into English. My husband and I are reading it together and every couple minutes we stop and exclaim about how amazing Rabbi Lau is. I HIGHLY recommend his book!